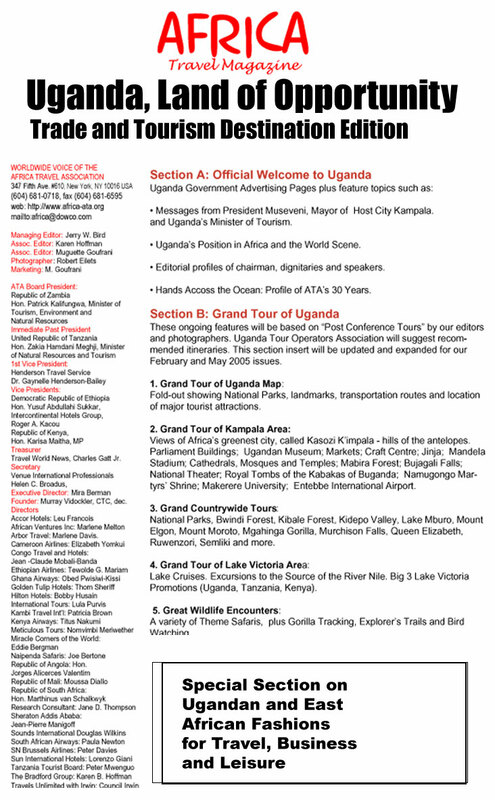 The Africa Travel Association (ATA), the world’s leading travel trade association promoting travel and tourism to Africa, held its 39thAnnual World Congress in Kampala, Uganda from November 11-16, 2014. With the theme “Tourism is Everyone’s Business,” the congress brought together over 500 i­nternational and local delegates from the public and private sector to discuss the most pressing topics to advance the African tourism industry. The congress was officially opened by H.E. Yoweri K. Museveni, President of the Republic of Uganda. In his remarks, President Museveni urged Ugandan officials to increase promotions and marketing of the country as well as discussed the tourism potential of the nation. In a show of support of the Uganda tourism sector, First Lady of the Republic of Uganda, H.E. Janet Museveni, hosted the Congress Patron’s Dinner and ATA Awards Ceremony. 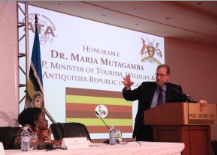 The congress was hosted by the Uganda Ministry of Tourism, Wildlife and Antiquities under the auspices of Honorable Minister Dr. Maria Mutagamba and supported by the Uganda Tourism Board, local ATA Uganda Chapter, and members of the private sector. Additionally, during the ATA membership meeting Minister Mutagamba was elected to serve as the next president of the association. Delegates represented over twenty countries including Cameroon, Canada, Cote d'Ivoire, Ethiopia, Gambia, Italy, Kenya, Liberia, Namibia, Nigeria, Rwanda, Seychelles, South Africa, Switzerland, Tanzania, Turkey, Uganda, the U.S., the U.K., Zambia, and Zimbabwe. During the congress, the African Development Bank (AfDB), New York University (NYU) Africa House, and ATA launched the 2nd Edition of the Africa Tourism Monitor. From 2012 to 2013, Africa saw a 5% growth in arrivals with 65.1 million (2013) and $43.9 billion tourism receipts. The theme of the report was “Leveraging Africa’s Human Capacity for Tourism Development,” the report emphasized the crucial role tourism plays in Africa, as it harnesses the potential to increase trade, create socio-cultural linkages, and spur economic and job opportunities. ATA’s 39th Annual World Congress featured a full-day Tourism Investment Forum where tourism business leaders, industry stakeholders, and investors discussed the latest tourism development and investment trends. The day started with a keynote address by the Eng. Dr. Ajedra Aridru, Minister of State for Finance, Planning and Economic Development who presented a range of investment opportunities in Uganda. In a session on tourism facilitation, representatives from the African Union, New Partnership for Africa's Development (NEPAD), Computer Frontiers, and the Association of Uganda Tour Operators discussed policydevelopment, strengthening intra-Africa partnerships, infrastructure development, visa processing, and creating linkages between the public and private sectors to advance Africa’s tourism growth. Moderated by CNBC and Forbes Africa, the panel on Africa hotel investment and expansion explored opportunities and challenges of development on the continent and attracting customers to a range of hotel types with representatives from Jovago.com, Protea Hotels, Serena Hotels, and W Hospitality Group. Led by the International Air Transport Association (IATA), the “Africa Air Access” panel featured representatives from the continent’s leading airlines like Brussels Airlines, Delta Air Lines, Ethiopian Airlines, and South African Airways. H.E. Scott DeLisi, U.S. Ambassador to the Republic of Uganda, welcomed ATA delegates on behalf the embassy and encouraged the Ugandan government to foster an environment friendly to tourism growth and foreign investment. World renowned travel journalist Peter Greenberg, Travel Editor for CBS News, delivered a thought-provoking keynote address to open the travel trade sessions and also moderated the Tourism Ministers’ Roundtable with Ministers from Kenya, Namibia, Tanzania, and Uganda. Greenberg emphasized the role government can play in engaging the media. The congress program included an overview of global tourism trends and outlook by Euromonitor International. In the session “Marketing African Destinations,” tourism boards and representation firms discussed destination branding and creating a competitive edge. The panel was led by the Uganda Tourism Board with panelists from the Kenya Tourism Board, Seychelles Tourism Board, The Bradford Group (representing Tanzania), and Partner Concepts (representing Botswana). Led by the Association of Uganda Tour Operators, the Tour Operators’ Roundtable covered strategies for attracting American travelers, creating partnerships, product development, marketing, and health and safety concerns with front-line U.S. and Ugandan tour operators. With an emphasis on social media and experiential marketing, E-Tourism Frontiersand RW Social presented trends and tools for destinations and private sector operators to increase exposure and engage with consumers. Additionally, ATA’s monthly #Africhat Twitter conversation happened live from Uganda and the congress hashtag trended for the day. - and Air Highways to Uganda - appearing in this same, exciting issue.